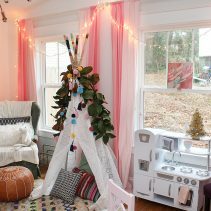 I love infusing my style into my Christmas decor and creating a fresh, non-traditional holiday home. 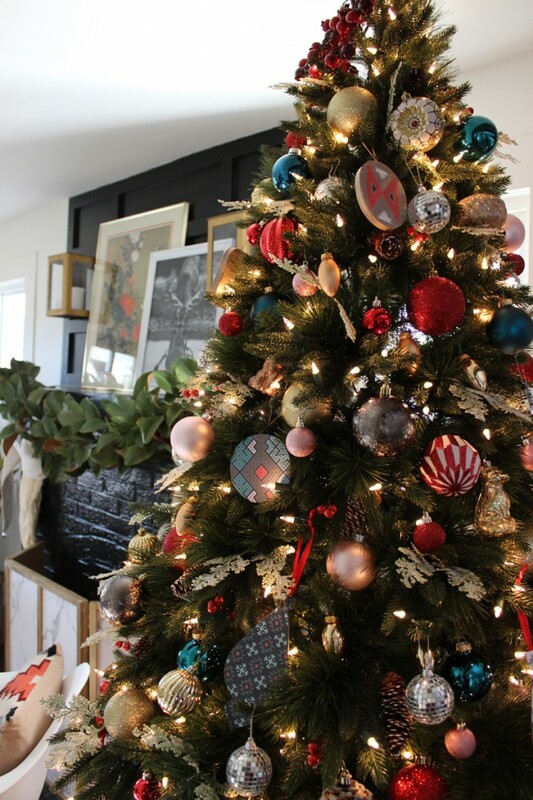 I love choosing a theme and decorating our tree and the rest of our festive home to reflect it. But having a baby changes things. I’ve always been a sentimental person, but little Rosie coming has put that on over-drive. And I’m a bit ironic. In so many ways, I love living on the fringe. Not for the sake of being different, but because that’s what I legitimately like. But I also love tradition. I love family traditions. I love Christmas traditions where every year you get excited because you know certain magical things are coming. And little Rosie has me thinking a lot about tradition and creating that magic for her and our growing family. This year, I decided to pair my love of style with some family tradition. I started with our stockings. 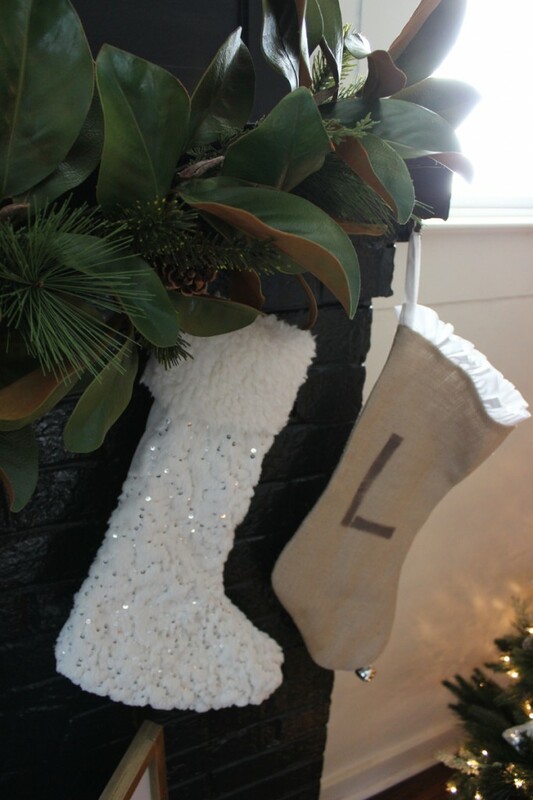 The two burlap stockings with C & L were made for us by my sweet mama for our very first married Christmas. 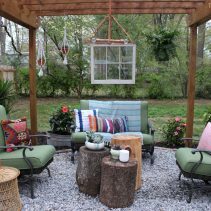 Last year, I updated them with some trim and fabric to fit my chosen theme. And I really did love how they turned out. I purposefully used safety pins and made everything removable, knowing I would want something different in the future. But this year, I needed a stocking for little Rosie. I started looking at pretty floral stockings that fit our color scheme, but nothing felt just right. I kept thinking about one Chris’ family traditions that he loves. 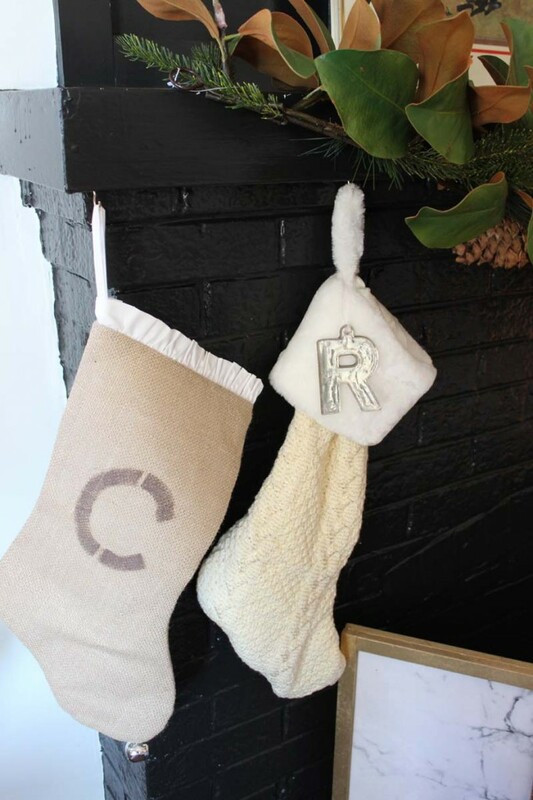 When each child was born, they were given a stocking. 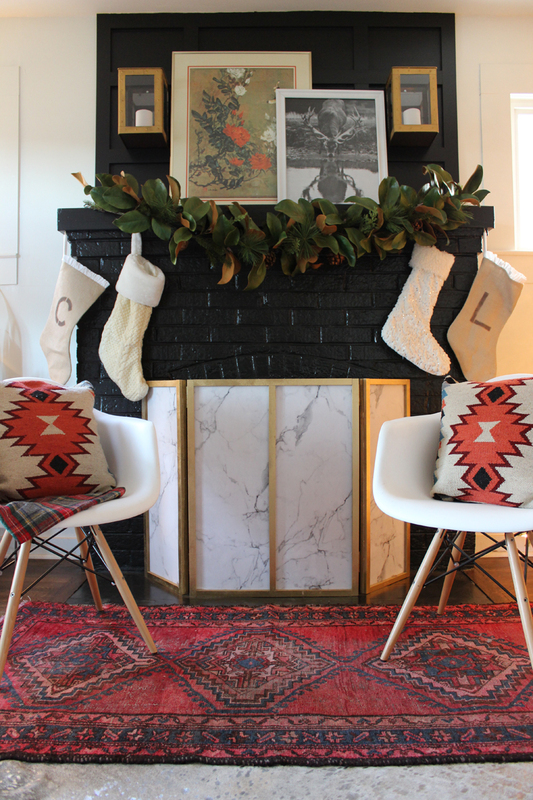 They still have those stockings today and have a big tradition of hanging them on the mantel every year. I wanted that for our family. 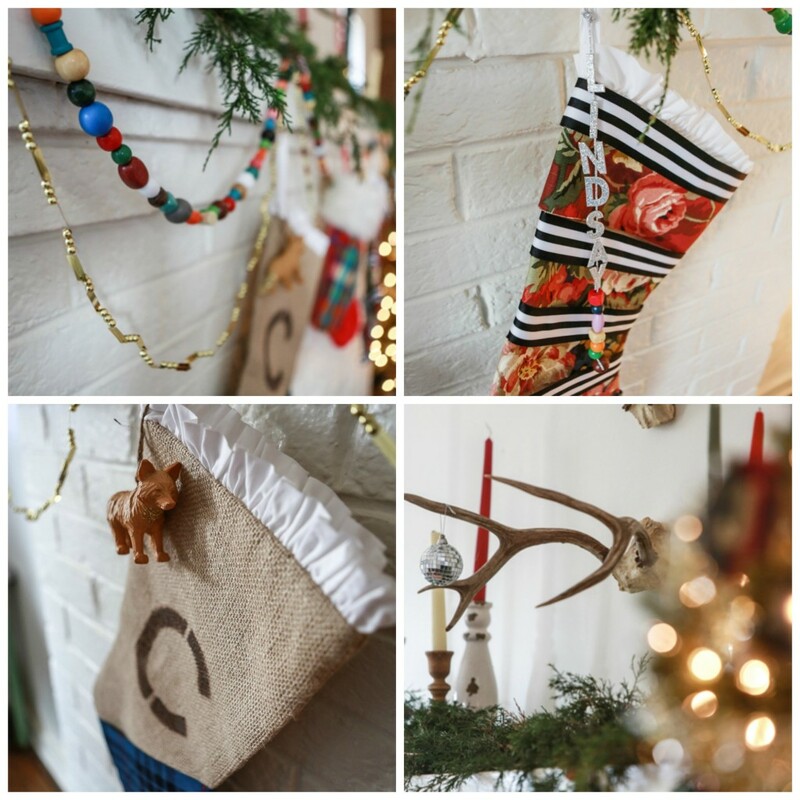 I love the idea of every year, taking out these stockings from our first Christmas. And little Rosie taking out the same stocking every year to hang on the mantel. 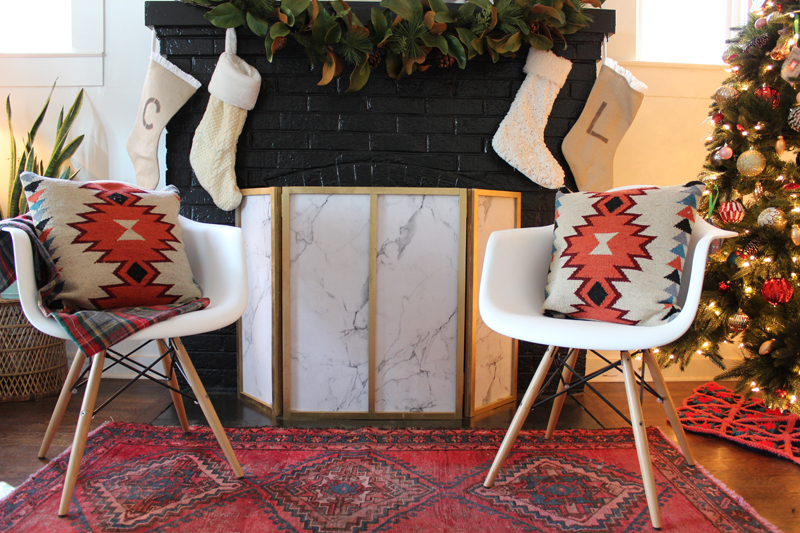 I chose a neutral stocking for Baby Rosie and Gracie so that they can transition to whatever Christmas decor I choose in the future. Another way that I brought in a little more tradition this year was with a second tree, a Family Tree. We have childhood ornaments, ornaments purchased on our Honeymoon, ornaments I purchased for our first Christmas…so many memories. I’m embarrassed to say that some years I don’t even take them out of the box because they don’t fit my “theme” tree. 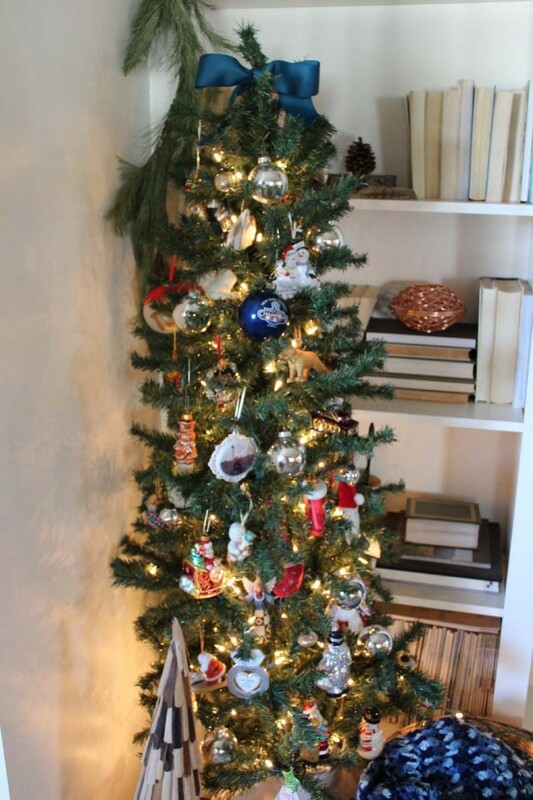 But this year, I was thinking a lot about future Christmases and the family tradition of decorating a Family Tree together and reminiscing with every ornament. And I knew. We needed two trees! One for my pretty, themed ornaments and one for the special ones filled with memories. Chris and I decorated this tree together this year and had the absolute best time. With each ornament we hung, we talked about the memory behind it. It’s one of my favorite Christmas memories we’ve made and I can’t wait to continue it in the future. And now, this little tree is one of my favorite trees. I love looking at it and seeing memories and meaning spread all. I’m so happy to finally accept that style and tradition, pretty and memories, it all goes together into one lovely little Christmas package. 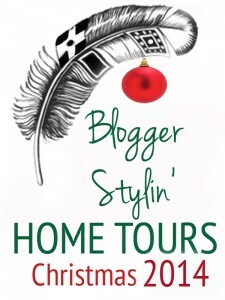 Don’t forget that Blogger Stylin’ Home Tours is going on this week! I’ve been blown away by these amazing Christmas homes! 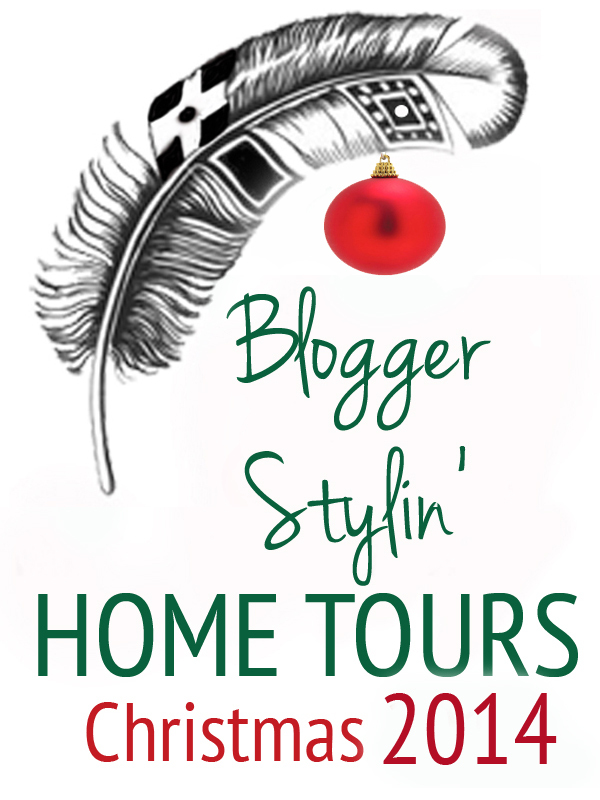 You can start the tour here and then click through to all of the other lovely stops along the tour! Subscribe to our daily feed to make sure you don’t miss any Daily Doses of Style! 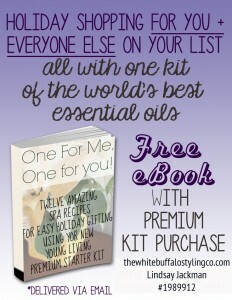 Don’t forget about the free eBook giveaway when you sign up for Young Living Oils! Yes! I love this! Because before you blink, she will be decorating with you! I love the magic behind it. The excitement building up…love this so much. And you! Happy Wednesday! So I love this post because it so you. I can’t wait to watch as you make memories with this new little one! So so sweet and soo precious! My family is very traditional for Christmas. My mom made stockings for my brother and I and we used them up until a few years ago. I actually have mine but it feels weird for it to not be at my parents, even though we don’t do the stockings now. We bought embroidered stockings for us all and I look forward to my kiddos growing old enough to remember using them. Love the family tree. 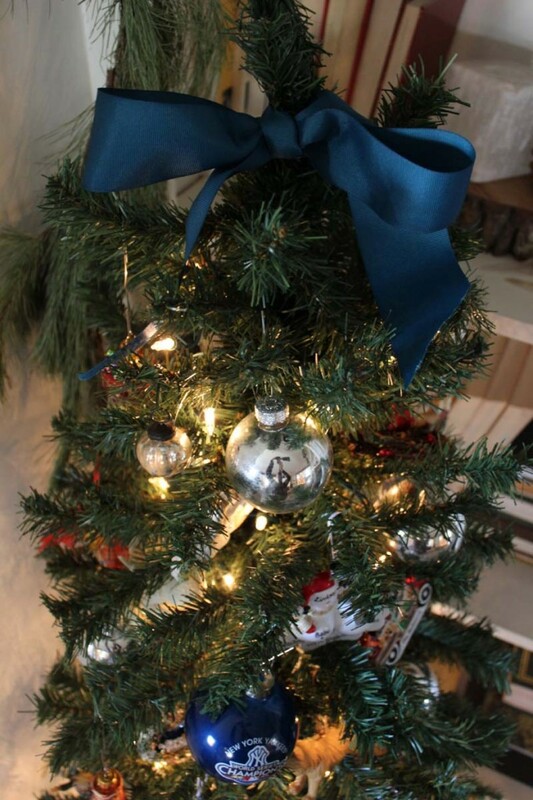 Our “main” tree is a mix of every ornament, including homemade, store bought, hallmark, etc. I have two trees on my mantle that are decorated with vintage ornaments. Some day I may do a pretty only tree but not until my kids are older. I’ve always loved the idea of having two trees. 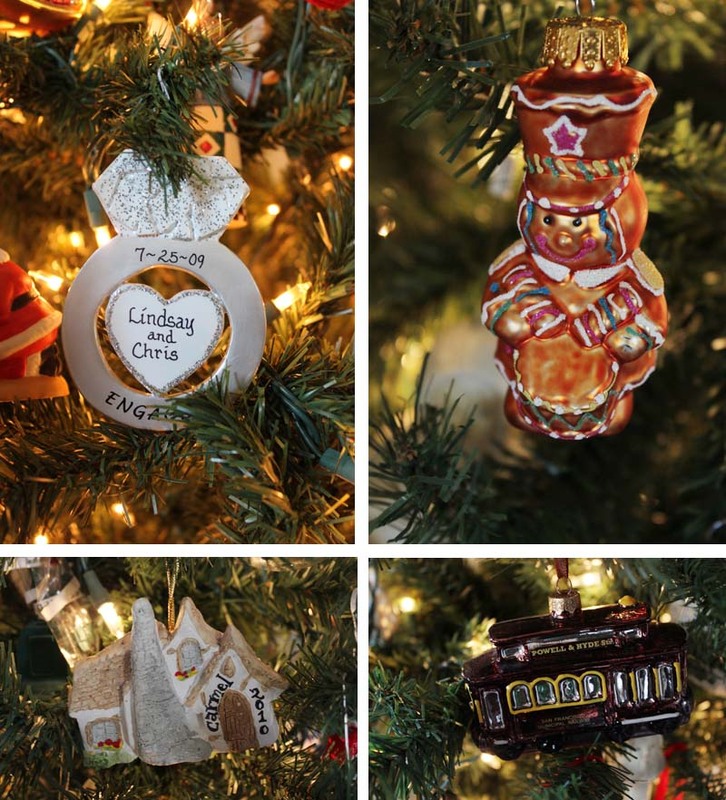 And to stop as a family and reminisce over the memories attached to each ornament is beautiful! This is exactly what we do! 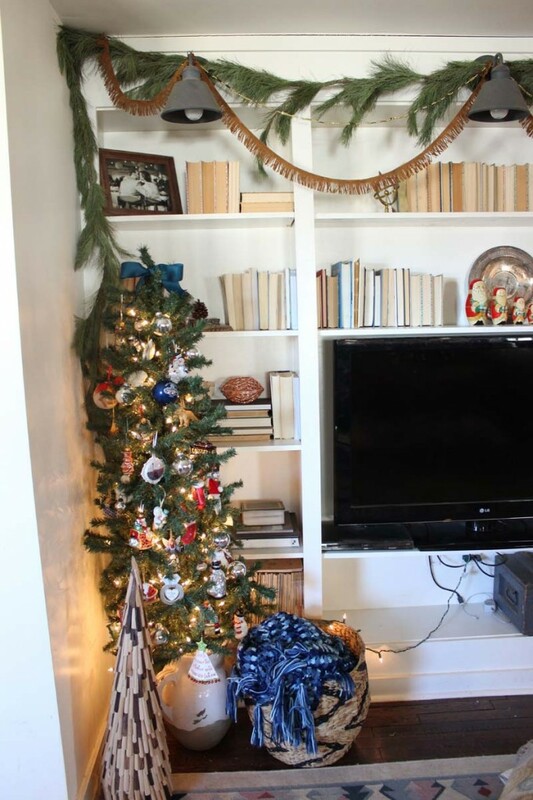 A family tree with sentimental ornaments! Next year I think I am going to doing advent using the book The Greatest Gift which comes with ornaments and those will be added to the tree. I hoping it will be a new family tradition to do with my girls, teaching them the TRuE meaning of Christmas! weeks … and sharing her first Christmas. God bless you, Chris, Rosie, and Gracie in 2015! Papa and I love you!